Opposition leaders are urging Venezuela's powerful armed forces to withdraw their support for embattled President Nicolas Maduro. And they are taking their campaign abroad by lobbying foreign governments to cut diplomatic and economic ties with Caracas. 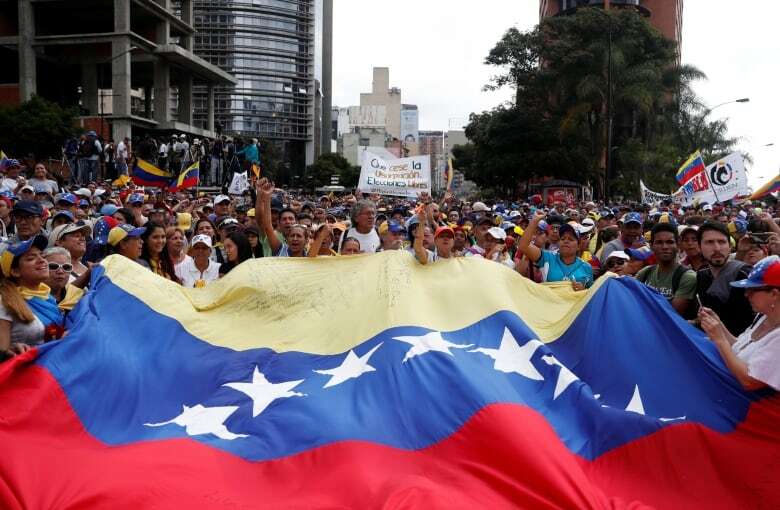 Throngs of Venezuelans are marching Wednesday in anti-government protests, as the oil-rich country's political opposition ramps up efforts to oust Nicolas Maduro, the country's authoritarian president. But this is more than a battle for control of the streets. Numerous Latin American nations as well as Canada have already downgraded diplomatic relations with Caracas. Last week, Prime Minister Justin Trudeau called Maduro an "illegitimate dictator" who is responsible for "terrible repression." Maduro, who was first elected president in 2013 by a thin margin following the death of socialist leader Hugo Chavez, is deeply unpopular. He has led Venezuela into hyperinflation and severe food shortages, sparking an exodus of more than three million Venezuelan refugees, according to the UN. Still, Maduro has fended off all challenges to his rule. His government has arrested political opponents, banned others from running for office, and has dispatched security forces to crush street protests. On Jan. 10, Maduro was sworn-in for another six-year term following an election last year considered a sham by much of the international community. "Maduro and company have all the power but none of the legitimacy and the opposition has quite a bit of legitimacy and none of the power," said Frank Mora, who heads the Latin American and Caribbean Center at Florida International University. The current campaign against Maduro is led by Juan Guaido, the newly elected leader of Venezuela's congress, the only branch of power controlled by the opposition. Guaido is just 35 and until this month was largely unknown. But he has been thrust into leadership as more prominent politicians have been jailed or forced into exile. Analysts say he is energizing the opposition after years of infighting over tactics, strategy and leadership. Gauido has been holding town-hall style meetings and drumming up support for his plan to form a provisional government that would hold elections within 30 days. "We must say 'no' to the usurpation of power," Guaido told a recent rally in Caracas. "We need a transitional government and free elections." Maduro has long blamed Venezuela's problems on what he describes as an "economic war" being waged against his government by Washington and its allies in the opposition. Last week, he dismissed Guaido, the new congressional president, saying: "This guy, Guaido, is a puppet, an agent of the gringos." There is also speculation that Guaido may declare himself acting president. Venezuela's constitution states that the head of congress takes over the top job should the presidency become vacant – as the opposition claims it has under Maduro. Guaido was briefly detained by security forces last week and speculation is growing that if he claims the presidency he could be jailed. 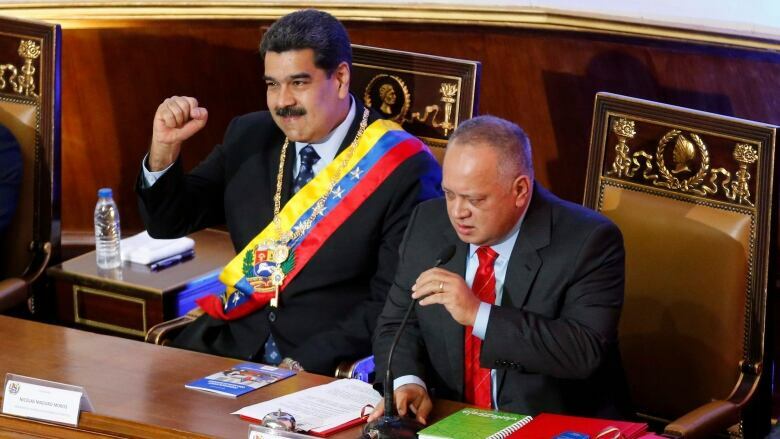 On Monday, Venezuela's Supreme Court, which is stacked with Maduro allies, declared Guaido and the entire congressional leadership "illegitimate." "He will become a lightning rod for repression," said Bruce Bagley, a Venezuela scholar at the University of Miami. "It is quite probable that he will be subjected to persecution and pretrial detention." There were concerns that Wednesday's protests could be marred by violence, after demonstrations late Tuesday left at least one young man dead, a local rights group said. During anti-government marches in 2014 and 2017, nearly 200 were people were killed amid clashes between security forces and protesters. "In the recent past, we have seen security forces kill innocent protesters. We are worried it will happen again," said Juan Andres Mejia, an opposition lawmaker who helped organize Wednesday's marches. So far, the bulk of the armed forces has remained loyal to Maduro, who has showered the top brass with perks and placed officers in charge of several government ministries and the oil industry. To convince officers to rebel, opposition lawmakers on Tuesday passed an amnesty bill for those who switch sides. There have been a few cracks in military solidarity. Counterintelligence agents have reportedly squashed several coup plots before they were launched. 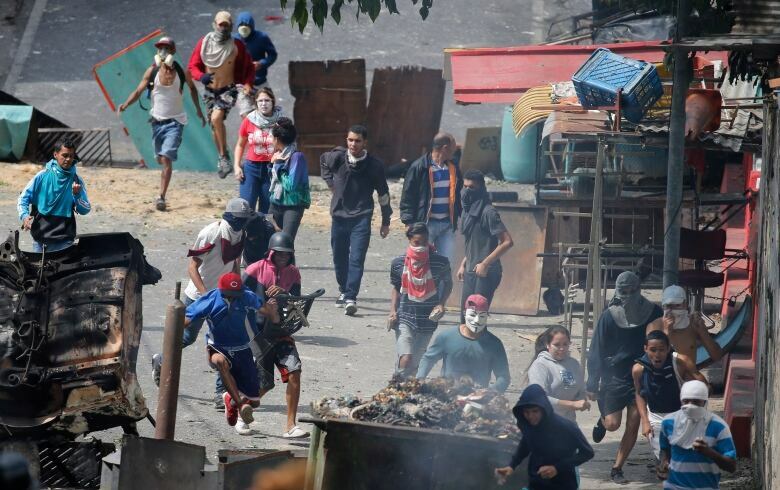 On Monday, a small group of National Guard troops raided an arms depot in Caracas and called on Venezuelans to support their uprising. They were quickly arrested. Bagley, of the University of Miami, said other pressure points could be exploited to help force Maduro out. Although the U.S. and the European Union have imposed economic sanctions on Venezuela, he said they could go much farther. For example, Bagley suggests halting purchases of oil, Venezuela's main export. "It may well require more severe economic sanctions, coordinated sanctions as there were with South Africa during apartheid," he said.